After Andrew’s Top 25 Westerns, Andrew and I decided to do an ongoing series about the western genre, looking at actors, bad guys, TV and film. Since westerns on television were pretty much children of the 50ʼs and 60ʼs, it seemed appropriate for me, as a certified geezer, to take the first crack at it. This “sub-genre” of the western lasted pretty much from 1949 to 1973, actually peaking in 1959 when as many as 25 prime time shows were traditional westerns as were many of the top 20 shows in the Nielsens in any given week. In this article, we explore those individual actors who became larger than life as the indisputable stars of their shows. No attempt is made to rank them. And several of the best western series ever made will be excluded because they were anthologies or feature ensemble casts where the show was not carried by a single actor, and as such, are better suited for a separate article. Without further fanfare, here is one man’s list of some of the very biggest stars of the small screen in the western genre and why they mattered. William Boyd - Hopalong Cassidy was created in 1904 as a pulp novel character who was a vulgar, hard drinking, fighting, cattle wrangler. When a film was made in 1936, Boyd was asked to read for a minor role. Instead, he requested to read for the lead and won the part. Dressed in fancy all black costumes, Boyd changed the character to a much more likable and moral figure and starred in over 60 matinee films. 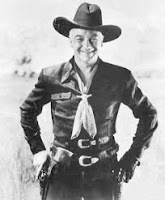 Early recognition of TV’s potential caused him to purchase all rights to the Hopalong character, netting him a fortune, and on 6/24/49, Hopalong Cassidy became the very first western series broadcast on television. NBC used edited versions of his feature films while waiting for new episodes to be produced. The success of the show quickly prompted similar shows for other stars of the “B” western film genre that had become popularized during the late 30ʼs and 40ʼs. Jack Carlton Moore - Under his stage name “Clayton,” Moore is best known for portraying The Lone Ranger on television and in two feature films. The Lone Ranger, originally broadcast as a serial radio drama in 1933, followed the exploits of John Reid, sole survivor of a group of six Texas Rangers who were bushwhacked by the outlaw Cavendish gang. Left for dead, Reid is found by the Indian Tonto (Jay Silverheels) who nurses him back to health. Together, they dig six graves, and Reid wears a mask to disguise his true identity. The show ran from 1949 to 1957. Moore was a model with only a couple of bit roles in “B” films when he was spotted by a coproducer of the series. He trained his voice to resemble that of the radio character. 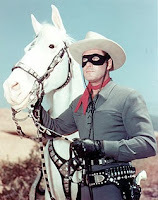 The Lone Ranger character is trademarked by his mask, powder blue suit, silver bullets, horse silver, and of course, the William Tell Overture, which became mega-famous by its use on the show. Moore was replaced briefly by John Hart after a contract dispute, but had become so entrenched in the role that audiences rejected Hart despite the mask. The rights to the show were sold and Moore was rehired. Moore and his character remain one of the most iconic in the history of westerns. The Singing Cowboys - Driven by the success of Hopalong Cassidy, the two unrivaled box office champions of “B” movie westerns in the 40’s quickly jumped aboard TV’s western bandwagon. We’re talking about none other than Orevon Grover Autry, aka “the Singing Cowboy,” and Leonard Franklin Slye, better known as Roy Rodgers, aka “King of the Cowboys.” Gene, as he became known, was 4 years older than Roy and their careers were eerily similar. Both started out as recording artists before breaking into western matinee films in the mid-thirties. Throughout the forties, they became the biggest draws in “B” westerns (or “horse operas” as fellow practitioner John Wayne called them), where they were known for featuring their own ballad singing in their films. In the 1950s, they moved to TV, where their half-hour shows were aimed at the youth market (such as myself). Master marketers, these two did wonders for 50’s children’s fashions (known today as “retro” western shirts favored by country rock artists), plus lunch boxes, action play figure sets, cap guns, and the like. Both men are hall of famers with Hollywood stars, and could never be left off a listing such as this -- another singing cowboy, “Tex” Ritter, was father of the late actor John Ritter, but he never achieved the mega star status of Autry and Rogers. Autry may be as well known for his Christmas songs such as “Rudolph the Red Nosed Reindeer,” and later ownership of the California Angels baseball team as his acting career. When Autry joined the service in WWII, Rogers became the undisputed champ of the genre, retaining the title even after Autry returned. In addition to acting, Rogers worked as a migrant farm laborer and founded the legendary western vocal group “The Sons of the Pioneers.” Rogers was paid a nice tribute in the Bruce Willis film, Die Hard. Richard Boone - Boone starred in the western drama Have Gun Will Travel, which aired from 1957 to 1963 on CBS -- usually ranking either third or fourth in the Nielson’s. 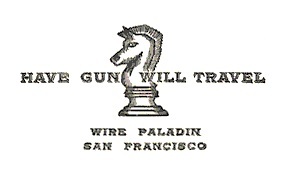 Based in San Francisco, Boone’s character is known only by the name “Paladin” (a play on words derived from the name given to the top knights of Charlemagne in the “Chanson du Roland”). Essentially, he was hired muscle for those in need (much like Edward Woodward’s The Equalizer). 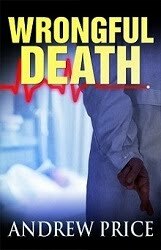 A former Union officer in the Civil War dressed in all black, Paladin would resort to violence only as a last resort, and in more than a few instances, ended up siding with the target if his original “client” was found to be in the wrong. What made this show special was that Boone played what amounts to a 19th century James Bond, being intelligent, witty, urbane, and well educated in addition to being deadly fast with a pistol. One of the main writers was a young Gene Roddenberry, and this show was in my view, along with Cheyenne, the best written of all the television westerns. Boone, who was related to frontiersman Daniel Boone, was a good enough actor to star in areas well beyond westerns. As such, he and his character Paladin probably do not reach the iconic status of the others mentioned, but personal prejudice requires his inclusion. As a l.o.l. aside, I was young and naive enough at the time to think the character’s actual name was Wire Paladin, admittedly a first name I had not heard before. Look at his card (above), damn it!! Was I not just being logical? . . . and the theme song . . oh my, best ever. Clint Walker - Walker is best known as “Cheyenne Bodie” in the television series Cheyenne, which ran between 1955 and 1963. The show was the first to be developed from scratch by a film studio, i.e. it was not developed from pre-existing film or radio properties. Orphaned as a boy and raised by Cheyenne Indians, Cheyenne was a drifter, allegedly looking for a place to settle down, but usually needing to keep on the move to find work. He often worked as a civilian army scout, cattle boss or farm hand. Trouble had a way of finding Cheyenne, and like some 19th century Mary Worth, he always seemed to find people to help. Tall, dark, handsome, soft spoken and brooding, Walker was in the mold of Gary Cooper’s “strong silent type.” A sample of dialog I still remember to this day-- Bad guy: “blah, blah, blah, what do you say to that, Bodie?” Cheyenne: “I say I think you’re trying to talk me to death.” Like others, Cheyenne was loathe to use violence, but was as adept with his fists as with his gun. 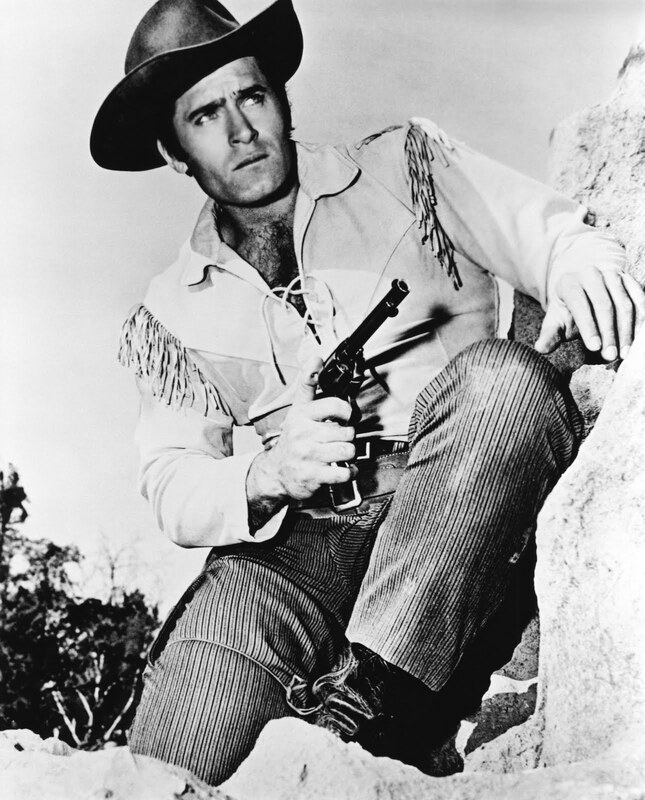 The show had surprisingly complex plots for its time and featured future stars like Angie Dickinson, Dennis Hopper, and James Garner, who appeared numerous times as different characters before getting his own Warner Brothers series Maverick -- I would argue for Garner’s inclusion on this list were it not for the fact he became so well known later in non-western roles, plus he shared the Maverick franchise with Jack Kelly and Roger Moore. As such, he was perhaps slightly less iconic in his role than Walker. He did create a new approach to the western lead character, however: the ramblin’ gamblin’ slightly “bad” boy who uses his charm and brains rather than his brawn or gun skills to win the day. For that, I thank him. There are numerous others that easily could be included on this list. James Arness (Gunsmoke), Hugh O’Brian (Wyatt Earp) Chuck Connors (The Rifleman) John Russell (The Lawman) and Michael Landon (Bonanza) quickly come to mind. Why I didn’t include them essentially boils down to either of two reasons. First, in the case of Gunsmoke, Bonanza, or even Rawhide with Clint Eastwood, the series had enough of an ensemble cast that the show itself became the star rather than any individual lead actor. Secondly, if I included all the stars that belonged, there simply wouldn’t be enough space. This, more than anything, is why I didn’t include Connors, O’Brian, Steve McQueen (Wanted Dead or Alive) or even James Drury (The Virginian). That’s the list. It may be far from perfect, but of course, I never claimed it to be definitive. I would certify everyone on it to be worthy of special status within that deliciously delightful sub-genre, the TV western. Hopefully, going forward, Andrew and I can come up with more articles on westerns, be it a look at stars of the silver screen, bad guys (my man Morgan Woodward, of course) and more. What do you folks think? Who qualifies for “how did you leave him out” status? Jed, Thanks for the article! It's highly informative and enjoyable. I'd actually never heard of Paladin but I intend to check it out now. Thanks, Andrew. I just wanted to let you know, we are having heavy electrical storms come through which tend to knock me off line. So if I don't respond to comments right away, that is the reason. No problem Jed. Excellent list, by the way, there's nothing on the list I disagree with. I've been debating who I would add to the list if we were going to get more modern and no one comes to mind. Ian McShane proved himself in Deadwood (though I detest the show for the needless, tourettes-level swearing), but he's hardly monumental. I thought about Bruce Campbell in Brisco County Jr., but that didn't really spark the world on fire either. And I thought about Nathan Fillion in Firefly, but again, that didn't set the world on fire -- and none of these guys are now known as "western stars." So maybe the Western as a series is dead today? Instead, we get the occasion made-for-tv movie? Tennessee: From one geezer to another, thanks for the trip down memory lane. 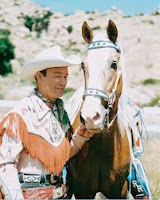 I was the world's biggest Roy Rogers fan, and even had a pretend horse named Trigger. But the shows I never, never, ever missed were Hopalong Cassidy and The Lone Ranger. For years, I thought that the Krauts had stolen the Lone Ranger theme and tried to turn it into a piece of classical music. Who the heck is William Tell? I also loved the Cisco Kid with Duncan Reynaldo and Leo Carrillo. My mom knew Leo very well, and helped form a Carrillo for governor campaign, but they had to settle for naming a state beach after him. 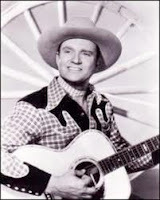 For some strange reason, and despite his ubiquity in the LA/San Fernando Valley scene, I was really quite ignorant about Gene Autry until I was in my teens. Thanks again. Great fun. And now I have to head up to my daughter's "rancho" and feed the animals. It has come full-circle. Andrew - it does seem like the westerns today are more geared towards mini-series or telemovies rather than weekly series. However, given Hollywood's passion for recycling, who knows? There were some more modern guys that I really liked . . . David Caaridine in Kung Fu comes to mind. I am not aware of Firefly and Nathan Filion (as Castle) is one of my own weekly "guilty pleasures," so that might be a good one to check out. Hawk - Yes, for me too, Roy is THE Man. Yippe Kayee and happy trails to you, Hawk. I had a full length closet door poster of "the King." Plus, all the marxx playset action figures. I look at old black and white pictures of me from childhood and it was all westerns. One guy I so wanted to include was Fess Parker. He only appeared as Davy Crockett in five episodes of Disney, however. Sort of more in the mini-series mold, I suppose, but he sure did sell a lot of coonskin caps. I also thank him to this day for letting his winery stand in as "Frass Canyon Vinyards" in the film "Sideways." Jed, Firefly is a science fiction story, but it's premised on westerns. It's a short-lived series that became the film Serenity. They use a civil-war-like backdrop, small dusty town on remote planets, western-like costumes, and western-like speech. It truly is a western in space and it's very enjoyable. Sadly, it got canceled before it ever had a chance to take off. P.S. I had a Lone Ranger silver pistol as a kid (cap gun), but no hat or horse. Still, it was enough! LOL! Hawk - I also enjoyed Cisco and Pancho. His costume must have been the model for "3 Amigos" I was also a fan of Guy Madison (along with Andy Devine) in "Wild Bill Hickock. They just didn't make the cut with the others. As far as Gene Autry, I am like you. I kind of knew about him, but Roy vs. Gene was kind of like "Beatles vs. Stones." You tended to be either in one camp or the other. For a while, I was getting DirecTV's full monty package which included about every channel in the universe including STARZ's western channel. They were running Cheyenne plus Gene Autry, but after catching pretty much a;ll the episodes, I decided to cut back on my monthly bill and drop a bunch of stuff. Tenn - If you haven't already, you must, must, must go to the Gene Autry Museum in Gene Autry, Oklahoma. It is in the his birthplace near the Texas/Oklahoma border. It's great. Jed, Nice article! I've got to go with the Lone Ranger too as my favorite, though I really became a huge Clint Walker fan later in life. In fact, I thought all these guys were great and I have to say they influence the way I grew up. Westerns really had a lot of great values in them and they had a code more people should live by! Andrew - thanks on your reference to Firefly. I think what happened in the 70's was traditional westerns vanished and the few that came after were infusing new elements be it modern urbanization (McCloud,) or Bond like gadgetry (Wild,Wild West,) Kung Fu (martial arts) or Dr. Quinn. After Lonsome Dove, the model seemed to shift towards the limited series or movies such as Conagher. That is one of the reasons I tried to limit the list to the old "classic" series. 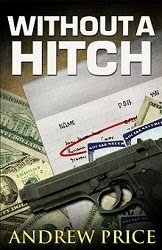 I think you will enjoy "Have Gun Will Travel." Of course, I was young then, and haven't seen it in so long, but at least watching the episodes of Cheyenne, I was amazed how well they stood up over time. There are a couple that I think could be added. Maverick and Zorro. Zorro has been remade several times. And Maverick was made into a movie. Ed - thanks, and I agree. One of the reasons I love westerns is they mirror my own code to live by (so to speak.) They reflect the consevative values of morality and self-reliance. Bev - I have to believe the Autry trip would be special in the extreme! Interesting article, Jed. Sadly, being a young whippersnapper, I don't know much about any of these guys or the shows/movies they starred in. Although, I do enjoy it every Christmas Eve when that radio sports announcer (Dave Thomas or whatever the heck his name is) comes on Letterman and tells his story of meeting Moore as The Lone Ranger. Also, I second Bev, the Gene Autry Museum sounds like a great place for you to visit. My grandpa would probably get a kick out of it as well. Ed - you know thinking about your comment and my response, I think it probable a lot of these characters probably tended to help shape my values. On the other hand, there are a lot of liberal weenies out there who probably watched the same stuff, but ended up in a decidely different place. (sorry, Jed) My dad LOVED these, so even though I have only seen some of them a couple of times in syndication, I have fond memories of them from my dad. He was the late-boomer TV generation - and my grandparents allowed the house to be scheduled by the TV guide. And if you think about it, the original Battlestar Galactica was a "space western" (kinda like Firefly) - and I adored that show too... so, yeah, I can see the western genre being subsumed by modern-day shows. continuing storms have knocked me off line. T-Tav and riaWTX. I joked with Andrew about how a lot of readers wouldn't remember any of this. More's the pity. T-Rav - You watch Letterman??? Here I thought you had taste lol! Andrew - I loved Wild, Wild, West as well. Ross Martin was a great side-kick, and Conrad super . . . bet you don't remember his first show "Hawaiian Eye" with Bob, Anthony Eisley, and Connie Stevens in a show about private investigators in Hawaii. What, you thought Hawaii Five-O and Magnum were the first??? "Get 'em up, move 'em up Rawhide" A western about drovers launched the career of a young Clint Eastwood. That's not what I meant, Bev!! Jeez! Jed, I never claimed to have taste; however, I don't generally watch Letterman unless there are some real liberal windbags on Leno. But he has a good Christmas routine, with Darlene Love singing "Please Come Home" every year, and I enjoy watching that at least. Anyway, he also has on this former quarterback and DJ (Jay Thomas is his name) who always talks about the time back in the early '70s when Moore showed up in his Lone Ranger outfit for a promotion of some kind at the radio station Thomas worked at then. To make a long story short, Moore was riding in Thomas' car, still in the getup, when they got cut off by another driver, which led to an altercation with the other guy shouting at Thomas, "Who do you think the cops are gonna believe? Me, or you hippies?" At which point "The Lone Ranger" gets out of the car and says authoritatively, "They'll believe me, citizen!" I'm not sure what it has to do with Christmas but it's a funny story. I definitely remember the Lone Ranger and The Rifleman as a young boy along with The Pondeosa, Gunsmoke, High Chapperal, etc.. I was well aware of the others too, since my Grandpa loved westerns. One of my favorite westerns of the 70's was Laredo, with Neville Brand, Philip Carey, Peter Broen and William Smith. It was a spinoff of The Virginian but better IMO, although I watched both. Man, I had a lot of fun with those pop guns. I can still vividly recall the smell of gunpowder from them, lol. I also tried to split trees in half with a hatchet, like Daniel Boone did (or was that Davey Crockett? Well, they both had Fess Parker so he was the guy). Needless to say, I couldn't repeat the results so I was probably doin' it wrong. T-Rav: Christmas is a time for nostalgia. What a great story. Unlike Boyd, Clayton Moore had to fight hard to portray his character at charities, autograph shows, etc. I remembering seeing Moore in an old movie without the mask. It was his VOICE that made me realize who it was! I was so into Davy Crockett I simply couldn't watch Fess as Daniel Boone. That role apparently should have gone to Richard Boone l.o.l. I can see that about Guy Williams. I grew up mostly in New Mexico. Zorro was really big there. Star Trek designer Doug Drexler did a nice write-up on Have Gun-Will Travel and the Roddenberry connection. As the resident whippersnapper around these parts, all I'll say is, as great as TV is today, I kinda envy those of you who got in on the ground floor, so to speak, and were able to witness TV's first "golden age," in a similar way to how I envy the folks who saw Star Wars on opening night in 1977. There's a great line from Kelsey Grammar's "Old Prospector" character in Toy Story 2 about the decline of the western: "Two words: Sput-nik. Once the astronauts went up, children only wanted to play with space toys." Scott - great link. Glad to see Drexler saw things the way I did! 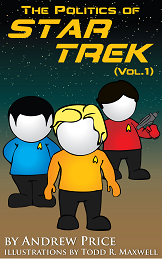 I thought something of exploring the Roddenberry connection more, but there was really not enough room. HGWT was the connoiseur's western, to be sure. The show did really well, but somehow, "icon" status eluded Boone. Still, I liked it so much, I couldn't leave him out. No wonder I liked Star Trek!